Heartburn is caused when stomach acid is pushed up into the esophagus. This results in a painful burning sensation and may eventually cause tissue damage in the esophagus. Several factors can lead to occasional heartburn and indigestion, including overeating, eating too quickly or eating too many sugary, fatty, spicy and fried foods. Other factors: lack of digestive enzymes, drinking caffeinated beverages, not drinking enough water, stress, alcohol, smoking, and the use of some medications. 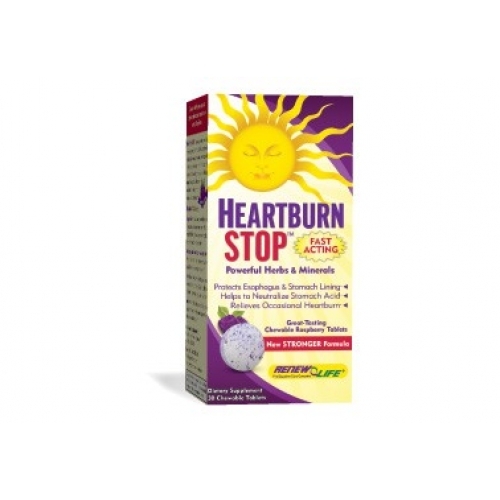 Heartburn STOP™ helps to relieve symptoms of occasional heartburn caused by excess gastric acid secretion. Natural ingredients such as ellagic acid (found in raspberries and pomegranates) work to gently reduce acidity. Phytonutrients and mastic gum help support stomach health. Heartburn STOP chewable tablets taste great and are a complete, natural way to relieve occasional heartburn.